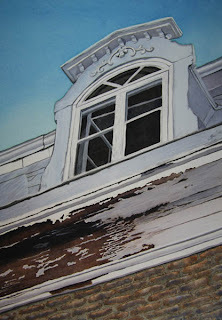 One of my paintings, Peeling Paint, has been chosen for the Landscape show at the Federation of Canadian Artists gallery on Granville Island from March 2 until the 14th, 2010. I am pretty happy to get into this one as I think landscape exhibits are tough to get into as there are so many great landscape artists out there! Congrats. I'm also in with a non-landscape type landscape! Congrats on the entry, Stacy! OK...I'm confused. What constitutes a non-landscape that would qualify for a landscape show? Btw, I've always loved this painting...whatever it's considered. Non-landscape type I consider anything that is not a scenic painting like mountains, fields, trees etc. Hi Tracey, I can see why it was chose. Its just amazing! Bravo girl!